This weekend, a man named Phillip Duffy will receive a grave marker which is being donated by Laurel Hill Cemetery. 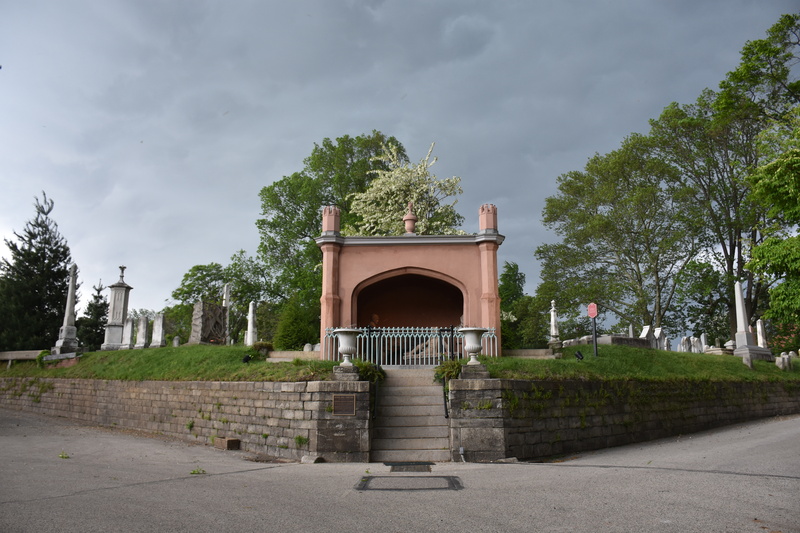 Phillip’s remains rest in St. Anne’s Cemetery in the Port Richmond section of Philadelphia, and until now, his grave has been unmarked… purposefully. When Phillip Duffy died in 1871, his family made the decision to keep his grave a secret because they feared it would be vandalized or desecrated. Why were his survivors so sure that the masses would descend on St. Anne’s Cemetery? What has this man done to draw the ire of the public like that? And for that matter, why is Laurel Hill offering to mark the grave of such a man at this late date? To tell that story, we need to go all the way back to the beginning. In East Whiteland Township, not too far from Immaculata University, sits an unassuming patch of woods alongside an active railroad track. In 1832 a group of 57 Irish immigrants from counties Donnegal, Tyrone, and Ulster, were brought in by Phillip Duffy to build Mile 59 of the Pennsylvania and Columbia Railroad; this section became known as Duffy’s Cut. It would not be an easy job. The area was densely wooded, and far from flat. Yet even though these men (and at least one woman) knew they would be working hard, few could have imagined their ultimate fate. What the historical marker doesn’t quite make clear is that not all 57 people buried at Duffy’s Cut died of cholera. While some did, it’s widely believed that some of the immigrants were murdered either to stop the spread of cholera, or out of a pervasive fear of immigrants at the time, particularly Irish Catholics. However, when the Historical Marker was dedicated in 2004, some very important archaeological findings were still 5 years away. It’s believed that a vigilante group formed among local land owners, and they descended upon the worker’s camp with axes, blunt objects, and potentially guns. Perhaps needing little prompting to go after a group they were already suspicious of, the cholera outbreak seems to have been the catalyzing event which put this whole tragedy into motion. Most of the workers were buried in a mass grave, while a few were found to have been buried in individual coffins. The workers had only been on U.S. soil for a few weeks when this happened. If further evidence collected continues to show signs of violence, it’s possible that Duffy’s Cut is the site of the worst mass murder in Pennsylvania history. Stones placed at what’s believed to be the site of the mass grave. It seems that there were several people working very hard to make sure the truth about Duffy’s Cut was never discovered. Two brothers: Reverend Dr. Frank Watson and Dr. William Watson (a history professor at Immaculata) came across some files which were saved by their grandfather before the Pennsylvania Railroad went into bankruptcy. In leafing through the records, the Watson brothers came across documentation blatantly outlining a cover up of the railroad worker’s deaths. They were immediately drawn to finding out the truth about what happened. Working with a team of archaeologists over a number of years, the site in Malvern was painstakingly excavated, and the remains of six men and one woman were unearthed. Signs of head trauma were identified almost immediately, and later confirmed in a lab setting. One skull appears to show a bullet wound, complete with lead fragments, while others show grisly axe blows to the back of the head. There are 50 bodies still unaccounted for, but the investigation is still underway to find more burials near the original excavation site. On March 9th 2012, Laurel Hill’s sister cemetery, West Laurel Hill held a memorial and burial service for 5 individuals recovered from Duffy’s Cut: four men, and one woman. Our cemetery superintendent, Bill Doran, an Irish immigrant himself, personally hand made the caskets and presided over the burial service. He also made a casket for John Ruddy, a young man whose body was returned to Ireland to be buried there. Students who had worked on the excavation site acted as pall bearers for the wooden caskets, and members of the 69th Pennsylvania Irish Brigade stood as an honor guard. The Watson brothers attended the service in full Irish kilt regalia, and lead a procession of bagpipes to the burial site. Bill Doran selected a 10-foot high Celtic cross made in Ireland, and set the marker. Researchers, clergy, mourners, Irish immigrants, and their descendants all stood as witness in the crowd. A full Christian burial service was provided, putting these individuals to rest the way they would have wanted, if they’d been given a choice. So Why Is Laurel Hill Marking Duffy’s Grave? While it’s unlikely that Philip Duffy himself had anything to do with the murders, his silence on the matter was criminal in its own way. So why would Laurel Hill want to help memorialize a man like that? It’s not so much that Phillip Duffy deserves to be remembered, it’s more than a bright light must be shed on this incident, and Laurel Hill is helping to keep this story alive in the minds of the public, rather than buried in obscurity. Duffy’s family knew that he’d be viewed as a villain, and they left his grave unmarked in the hopes that the world would move on and forget. For some 180 years, we did. Thanks to the Watson brothers, along with numerous students, researchers, historians, medical examiners, archaeologists, genealogists, and yes cemeteries, Duffy’s Cut will now be remembered. We hope this grave marker helps to bring some measure of closure. Like reading a history book, only way more interesting! Such a shame for those poor workers. That was a fascinating story. Previous What Can I Do in Laurel Hill?